Animal sculpture in silver was a fashionable choice for drinking cups around 1600 and was later collected by the Rothschilds. The head comes off to serve as a cup for alcohol poured from the hollow body. 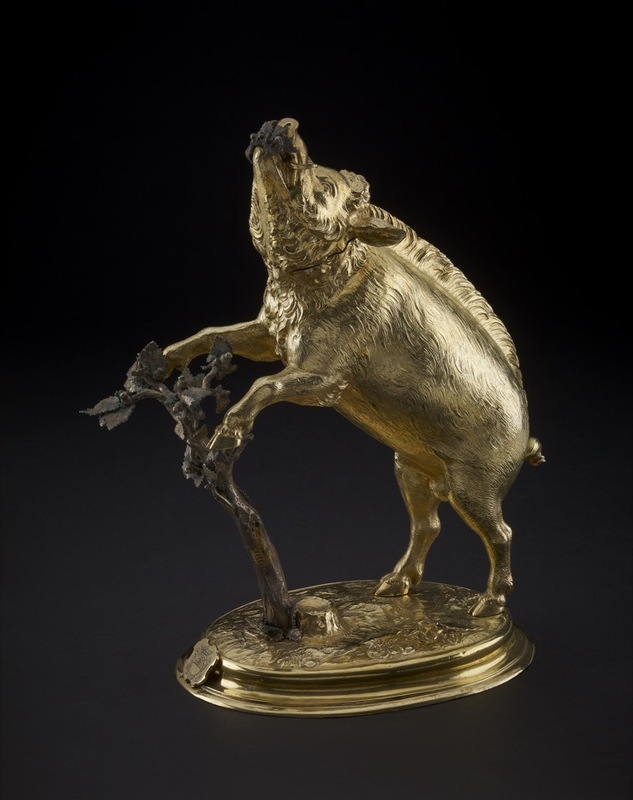 Used to toast guests, the cup celebrates the savagery of the wild boar as an animal of the hunt. It used to smell strongly of cherry brandy. Standing cup; silver-gilt; chased; form of rampant boar, fore-feet resting on small oak tree, leaves of which he is eating; removable head that forms a cup; oval stand, chased with plants; in front is modern shield engraved with arms under a coronet; inscribed. Origin: Augsburg; probably towards end of first quarter of 17th century; mark of Johannes (Hans) Lencker (master C.1602, died 1637). (i) Assay mark for Augsburg, 1600-25 (R3 138(? )), or Seling 42 (1620-5) or Seling 46 (1620-30). (ii) Crossed sceptres (or staves) within a waisted-shaped shield : the punch-mark of Johannes Lencker (R3 456; Seling no. 1157). These two marks occur on the foot-rim and again on the flange on the boar's head, which is detachable. Commentary: Johannes Lencker was born at Ludwigsorgett (in Fürstbistum Bamberg) in the early 1570s and married Barbara Endris in 1602, at which time he had become a master goldsmith in Augsburg. Thirty-five years later he died in Augsburg, having had a successful career, though his reputation has been overshadowed by his gifted brother Christoph who was also a sculptor and received many commissions for elaborate goldsmith's work from the Hapsburg Court before his death in 1613. However, the long list of extant works by Johannes Lencker includes documentary gold and silver items preserved in the Munich Residenz and in the Archbishop of Salzburg's Schatzkammer, as well as in Poland and Russia. The Waddesdon cup in the form of a boar salient is, however, not paralleled among his published oeuvre and is of such high quality, especially in the modelling and the chasing of the animal's head, hair and skin, that the commission undoubtedly came from a distinguished family, who probably used it as a Willkomm or welcome cup. Unfortunately, the coat-of-arms engraved on the small shield at the front of the base is modern and offers no indication of the identity of the first owner, although the base of the original shield would have been in exactly the same place, because there is no other reason why the two punch-marks should be so far apart that they neatly flank the shield on either side. Nor is there any other explanation for the small hole in the front of the oak tree, about a third of the way up the trunk; it must have been used to attach the top of the original shield. The most fully and convincingly documented example of the use of a similar boar cup being made as the Willkomm of an illustrious family dates from only a few years earlier; it is the famous Goldene Sau von Kandern, executed in Augsburg in 1605 by Balthasar Lerff for the Margrave Georg Friedrich von Baden-Durlach (1573-1638). The cup (H. 26.7 cm; the stand measures L. 25.4 x W. 9.8 cm) is now on display in the Badisches Landesmuseum, Karlsruhe; it was restored in 1772 and regilded more recently (see Sanger 1986, p. 636, no. L. 35, illus. on p. 635; Hannelore Müller in ‘Welt im Umbruch: Augsburg zwischen Renaissance und Barock’ II Rathaus, Augsburg, 1980, p. 341, no. 723; Seling 1980, pl. 152; J. M. Fritz, Goldene Sau von Kandern, ‘Jahrbuch der Staatlichen Kunstsammlungen in Baden-Württemberg’, vol. 14, Munich-Berlin, 1977, p. 710, fig. 18). The Karlsruhe boar cup, which is less finely executed and rather monotonously chased in a schematic fashion, differs from the Waddesdon example in having all four feet on the ground - that is to say, on the more traditional type of base (represented in the Waddesdon Bequest by WB.136 and WB.137). Furthermore, the detachable head fits on to the body in a different way, having a slightly everted rim that overlaps the rim of the body on the exterior, and its ugly jaws are depicted more open to reveal a fearsome assortment of tusks. By contrast, Johannes Lencker has added an element of heraldic dignity to the realism, thereby creating a sculpture in silver that is truly a work of art. The contrasting and highly naturalistic effect of ungilded silver (for the oak tree and the sprig of oak leaves and acorns being eaten by the boar) might have been enhanced originally by the application of cold enamel. Franz Schestag, ‘katalog der Kuntsammlung des Freiherrn Anselm von Rothschild in Wein’ Vienna, 1866, no. 199, with illus. Dora Thornton, 'A Rothschild Renaissance: Treasures from the Waddesdon Bequest', British Museum, London, 2015, pp.300-303.